Although the Karelian Isthmus front was less active in December than in January, the Soviets began increasing bombardments, wearing down the defenders and softening their fortifications. During daylight hours, the Finns took shelter inside their fortifications from the bombardments and repaired damage during the night. The situation led quickly to war exhaustion among the Finns, who lost over 3,000 men in trench warfare. 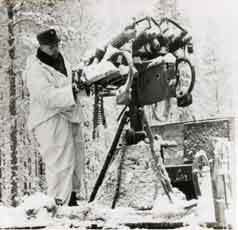 The Soviets also made occasional small infantry assaults with one or two companies.Because of the shortage of ammunition, Finnish artillery emplacements were under orders to fire only against directly threatening ground attacks. On 1 February, the Soviets further escalated their artillery and air bombardments. Although the Soviets refined their tactics and morale improved, the generals were still willing to accept massive losses in order to reach their objectives. Attacks were screened by smoke, heavy artillery, and armor support, but the infantry charged in the open and in dense formations. Unlike their tactics in December, Soviet tanks now advanced in smaller numbers. 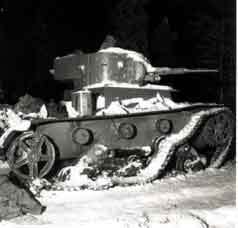 The Finns could not easily eliminate tanks if infantry troops protected them. After ten days of round-the-clock artillery barrages, the Soviets achieved a breakthrough on the western Karelian Isthmus in the second battle of Summa. On 11 February, the Soviets had about 460,000 men, over 3,350 artillery pieces, about 3,000 tanks, and about 1,300 aircraft deployed on the Karelian Isthmus. The Red Army was constantly receiving new recruits after the breakthrough. Opposing them the Finns had 8 divisions, totalling about 150,000 men. 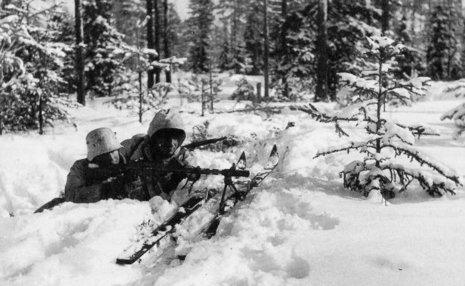 One by one, the defenders' strongholds crumbled under the Soviet attacks and the Finns were forced to retreat. On 15 February, Mannerheim authorised a general retreat of the Second Corps to the Intermediate Line. On the eastern side of the Isthmus, the Finns continued to resist Soviet assaults, repelling them in the battle of Taipale. the beginning of 1940 the Soviets tried to get a solution by concentrating a great contingent of troops, artillery and armoured forces to the Karelian Isthmus and Lake Ladoga Karelia. With a total force of a million men it started a total attack at the beginning of February 1940, supported by Air Force bombings against Finnish military and civilian targets on many places. Enormous artillery concentrations broke the Finns‘ defensive position here on the 15th of February, at which time the troops were withdrawn south of Vyborg.